In September Claudia Stormoen Pedersen, FIG Office, gave birth to a sweet little baby boy. While Claudia is on maternity leave, it is a pleasure to welcome Martine Eelderink in the FIG Office. Martine will be in the FIG office in Copenhagen from October 2017 and until end of May 2018 - this will give her a chance to also attend the Congress 2018 in Istanbul, Turkey that takes place 6-11 May 2018. Martine hopes to meet many FIG volunteers and attendees at the congress. 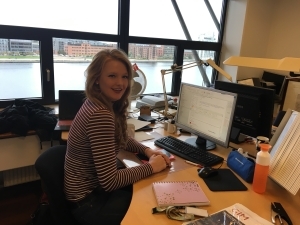 In May 2017 Martine attended they Young Surveyors European meeting in Helsinki, Finland. Martine will assisst in the office with general office and communication tasks, preparations for the FIG Congress 2018, other events, and will also be in contact with members and our many volunteers. Please note that in these fraud-email-times Martine will use the email address figsupport@fig.net. Martine is 27 years old, with an engineering and surveying background mixed with communication, and normally she lives and works in the Netherlands at Dutch Kadaster. Her stay at FIG Office is kindly supported by Dutch Kadaster, affiliate member of FIG, and the member association Geo-Information Netherlands (GIN). FIG Council and office thank Dutch Kadaster for this arrangement. You will still also meet/communicate with Maria Bargholz (email finance@fig.net)) in the FIG Office. Maria is working part time with FIG finances and general administration. From January to July 2017 we were so privileged to have Ms. Wu Qiong in the office as part of the exchange agreement with Chinese Society for Surveying, Mapping and Geoinformation (CSSMG). Ms Wu assisted with the preparations for the Working Week 2017 in Helsinki, Finland and was also attending the Working Week. At the end of July she returned to China, and I would like to extend a warm thanks to CSSMG for making this valuable exchange possible. Claudia will return to the office after her maternity leave, most likely in April 2018, and also plans to be in Istanbul in May.